But somewhere, beyond Space and Time, is wetter water, slimier slime! I remember the first time I found one, years ago, I wasn’t sure what it was…some sort of alien creature? What impressed me was how long it was, and how slimy. And that head, that strange, oddly-moving head! Turns out they are a terrestrial flatworm, or planarium. I have seen them off and on over the years, usually under a log that I rolled, but now I am finding them with more frequency in the plant beds and woods at work. 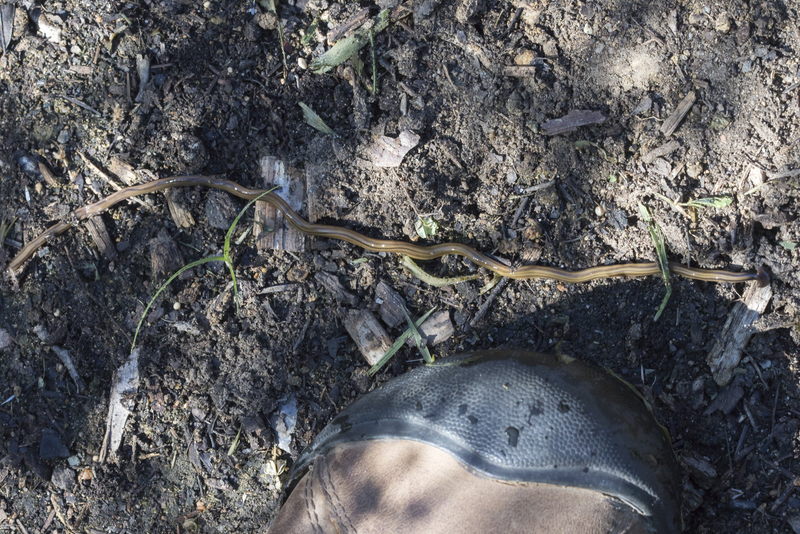 A few weeks ago, one of the horticulture staff asked me to come out and look at a strange “thing” they had found when moving some rocks in the children’s area, and that started a series of discoveries of these bizarre creatures that also go by the common name of hammerhead worms. Photographing these little slimy beasts is not particularly easy as they are often just one giant twisted and striped slime ball. The leading edge of the spade-shaped head ripples as the head swings back and forth (there will be a video of these guys in my future). These critters are believed to have come from Southeast Asia and were probably imported into this country on nursery stock. 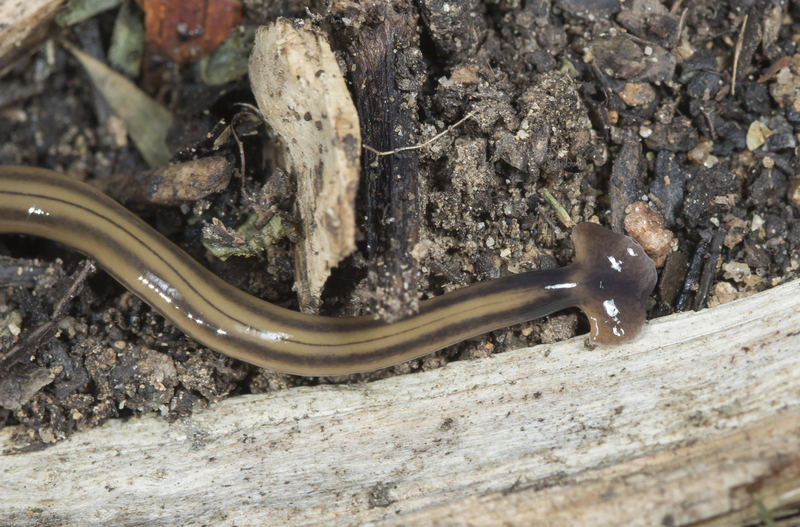 These odd-looking flatworms have an equally strange life history. They are hermaphroditic (both sexes in one). Although eggs and cocoons are known, the usual mode of reproduction is asexual – by fragmentation. A small portion of the worm’s rear end will pinch off, and “stay behind” as the worm moves forward. The head starts to form a few days afterward. They are predators, mainly on earthworms, which are digested externally (there are reports of them also feeding on slugs and some immature insects). 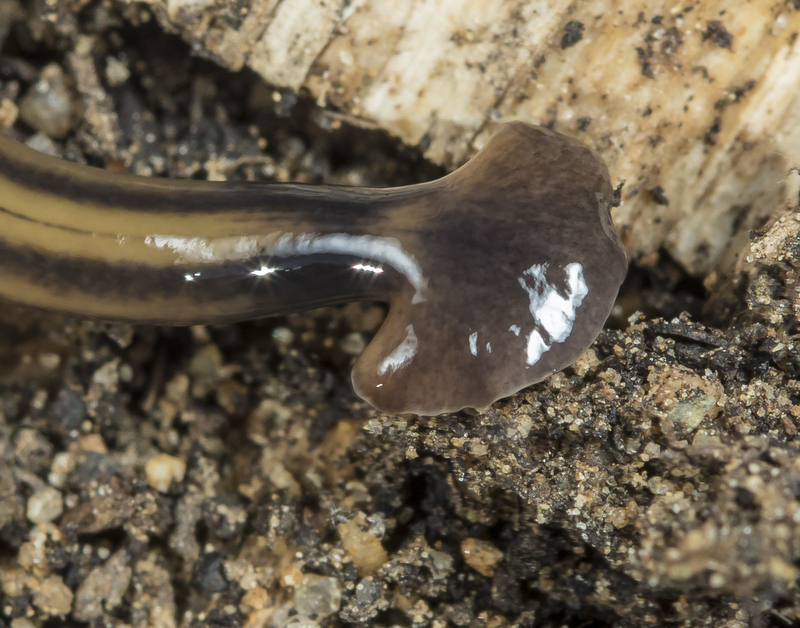 The flatworm first subdues its prey with a toxin and copious amounts of slime. Then it extrudes its pharynx from its mouth (which is located on its underside about mid-way down the body) and secretes digestive enzymes which basically dissolve the earthworm. This goo is then sucked back into the flatworm. 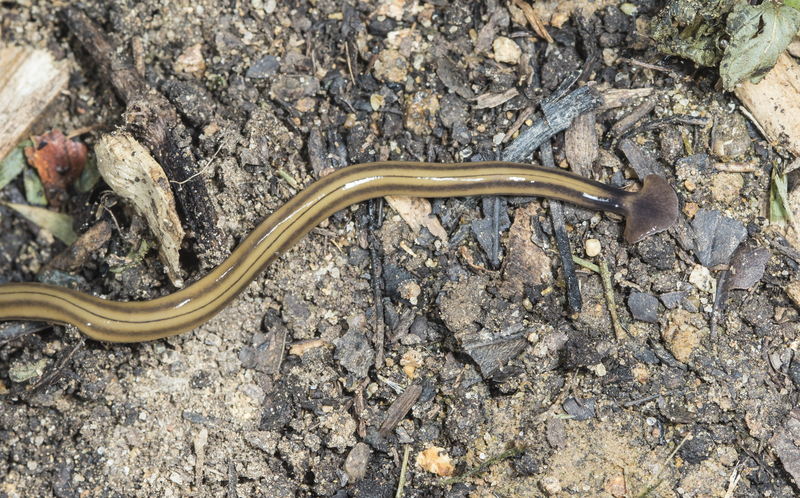 This entry was posted in Natural History and tagged terrestrial flatworm by roadsendnaturalist. Bookmark the permalink. What an interesting creature! Too bad they are an invasive/non-native species. Thanks for sharing. Interesting. They are a little creepy. Great article and photos. Agree…not too creepy, but highly “slimeiferous”. Thank you (yet again!) for such deliberate discovery and teaching us about our alien planet! I discovered these this year for the first time in my life. I am happy to know what they are but sad that another invasive is in our midst. Are we to ignore them or does a shovel in its middle create two of them? For now, I think it best to just leave them alone. Hoping someone can add more on their ecology before long.